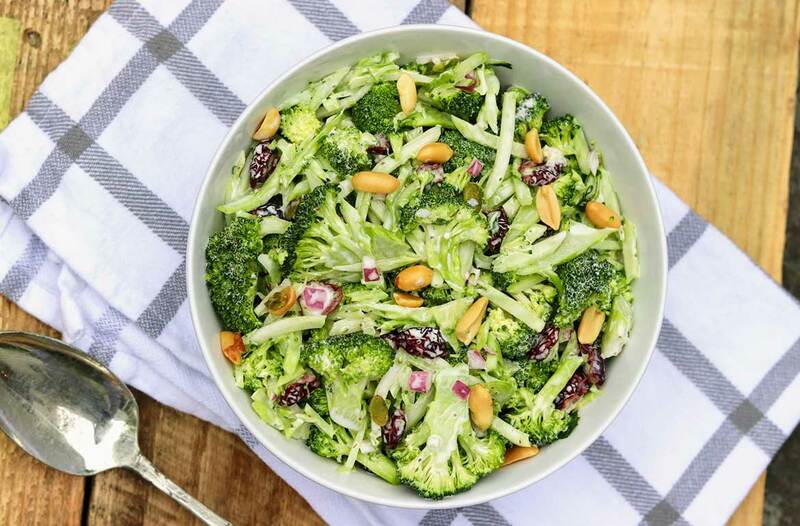 Perfect for a potluck, casual entertaining, or a satisfying lunch, this tried-and-true rendition of the classic broccoli salad can be assembled in advance in minimal time and varied according to preference. 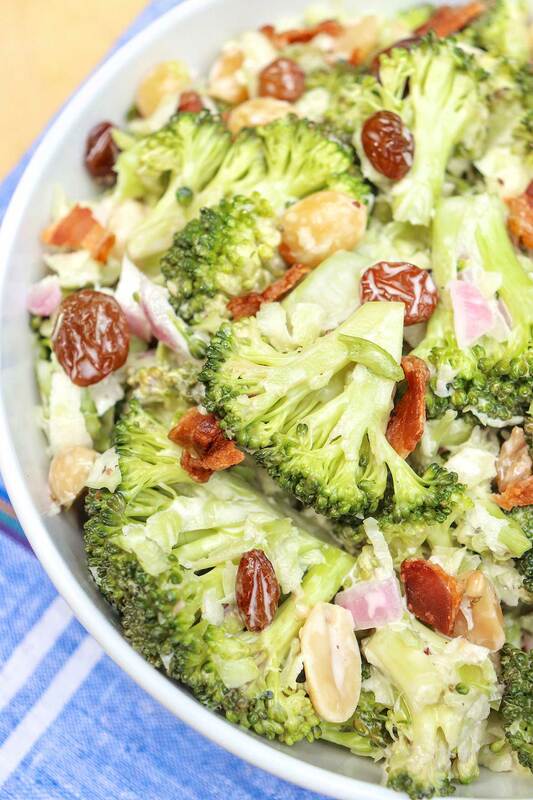 When using bacon in My Favorite Broccoli Salad, I like to add it just before serving to keep it crispy. Nuts and seeds will also maintain optimal crunch when sprinkled overtop at the last minute. Barbara wondered if I might have a recipe for broccoli salad similar to the one served at Isaac’s. She mentioned that their salad is slightly sweet and contains red onion but she wasn’t sure what else. Because she’s trying to keep added sugar and fat to a minimum, Barbara was hoping for a recipe that tasted great without relying on excessive amounts of customary ingredients like sugar, bacon, and cheese. My ideal iteration would be lightly dressed with a flavorful dressing but not swimming in it. The dressing should capture the signature tangy-sweetness of our restaurant favorite with the least amount of sugar possible. Cheese and bacon could certainly be utilized for added decadence, but the salad needed to pass the taste test without them. My final recipe allows for customization to accommodate individual preferences, allergies, and what may or may not be lingering in one’s cupboard. Unlike the restaurant version, I’ve recently taken to shredding the broccoli stems and tossing them in with the crowns. This lends a pleasant textural element, softening the bite of the cruciferous vegetable—plus nothing goes to waste! Along similar lines, you could use this dressing for a traditional slaw, using your favorite bagged mix or a combination of ingredients that you shred yourself, like red and green cabbage, broccoli, cauliflower, and carrots. As such, this recipe affords a convenient way to clean out your crisper drawer. My family enjoys this salad year round, as an unexpectedly popular side to mac and cheese in the colder months to a convenient accompaniment to burgers all summer long. The onset of the backyard barbecue season, however, seemed like a fitting time to share the recipe, as it can be made ahead and travels well. After receiving Barbara’s request, I promptly emailed her my recipe, and she made it the following day. Happily, she proclaimed it a winner, adding that she didn’t include the optional cheese or bacon but did opt for the celery seed, salted peanuts, and raisins rather than dried cranberries. Leftovers taste great for four to five days and offer an at-the-ready side dish for dinner another night. A bowlful makes a welcome lunch, too; in this case, I like to sprinkle with a palm-full of nuts and seeds for fresh crunch and a little extra protein. Perfect for a potluck, casual entertaining, or a satisfying lunch, this tried-and-true rendition of the classic broccoli salad can be assembled in advance in minimal time and varied according to preference. When using bacon, I like to add just before serving to keep it crispy. Nuts and seeds will also maintain optimal crunch when sprinkled overtop at the last minute. 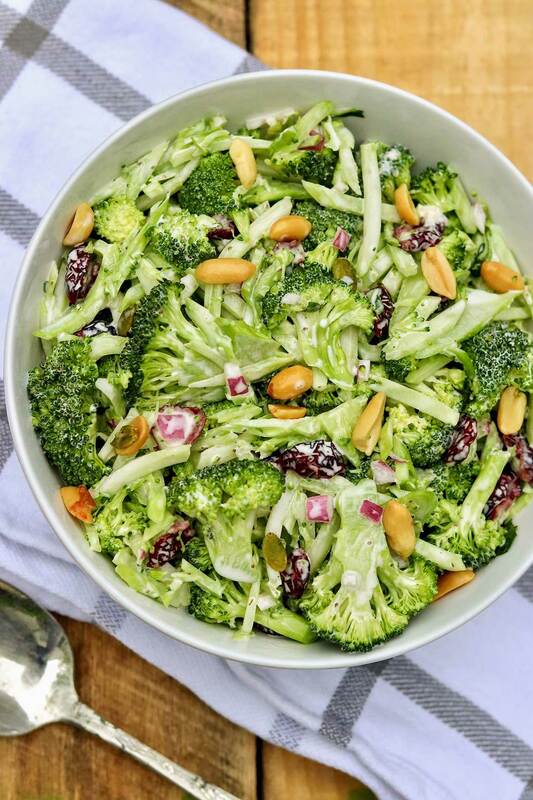 In a large bowl, toss together the broccoli, onion, and raisins or dried cranberries. Prior to serving, add the peanuts and optional cheese or bacon. Toss to thoroughly incorporate. Store any leftovers, covered, in the refrigerator where they will keep well for the better part of a week. *Optionally, you may make this salad with up to 16 ounces of slaw. I’ve used bagged slaws and a random combo of cabbage, carrots, cauliflower, and broccoli from my fridge—feel free to mix the crowns, packaged slaw, and/or shredded veggies to use up what you have on hand. As mentioned above, sometimes I coarsely shred the broccoli stems and mix them in with the florets. A large head of broccoli (or approximately 1 to 1-1/4 pounds) will yield 4-5 cups of florets. If you like a more heavily dressed salad, opt for the lesser amount of broccoli; use five or so cups if you prefer a lighter coating of dressing. Note that after the salad rests for an hour or two the dressing will seem more plentiful. **As another option, you could use 1/2 cup or so of halved fresh grapes in place of the raisins/cranberries or even add some chopped apple. ***On occasion, I’ve added 3 to 4 ounces of deli ham, chipped and roughly chopped, as a well-liked option to bacon. Your broccoli salad sounds wonderful, which I will try for my next outing. My question to you is why does your email come to me in regular font, but when I go to the recipe it is all with huge letters!? I cannot change the font for this on my computer! Strange! Hi Dorothy, Thanks for your comment regarding the salad. As for the font, I’m not totally sure what you mean, but I’m guessing it has to do with your settings, which could likely be changed easily. Does this happen just when you print the recipe, or are the letters on your computer screen large? With a little more information I might be able to help solve this problem! Oh my gosh. Made this. Love it. Our new favorite broccoli salad!!! That’s awesome! So glad it’s your favorite now, too! 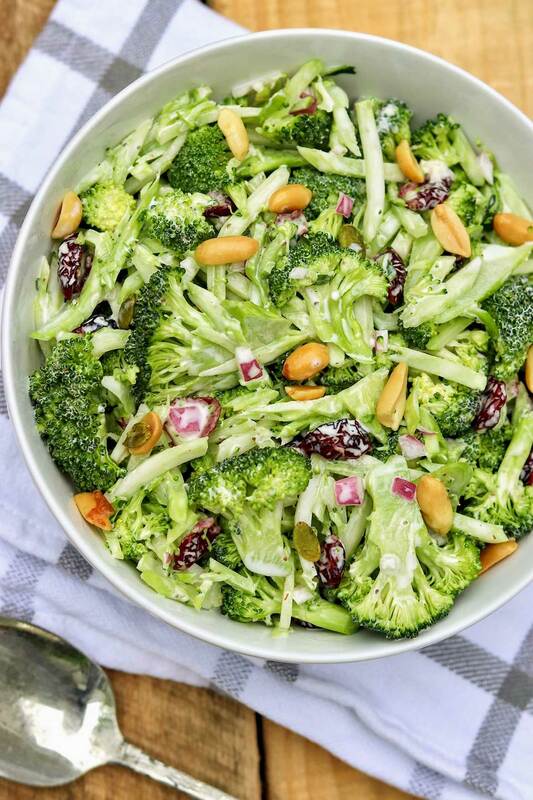 We love this broccoli salad!